In less than one month, the repeal of net neutrality that was voted on by the FCC will take effect. The narrow 3-2 victory for Trump's hand-picked FCC chairman Ajit Pai, means that carriers like Verizon and AT&T can throttle or block content from certain providers. 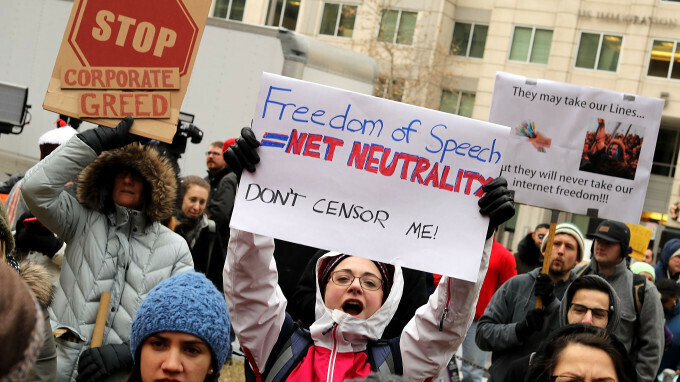 As it turns out, some individual states are defying the FCC vote by enacting their own laws that will keep net neutrality in effect. Washington and Oregon are in the process of passing such laws, and both states say that the FCC lacks the authority to stop them. In fact, half of the 50 states have legislation pending that would put net neutrality in place. Additionally, executive orders have been signed by governors in five states that protect net neutrality from being repealed. The uprising by the states has pissed off Verizon, AT&T and probably Pai, too. But Big Red and AT&T happen to be members of USTelecom, an association that represents telecom based companies in the U.S. The company, which lobbies for these carriers in Washington D.C., posted a long essay on its website earlier this week titled "All Americans Deserve Equal Rights Online." At first blush, you might think that this was a paper in favor of net neutrality. But the actual position being taken by USTelecom and its members is that the states should not pass their own rules for net neutrality and should it leave it up to the federal government to decide what to do. This would allow for one policy that would cover all Americans, even if it is not the policy that most Americans would prefer. Consider this sentence from their article, "Protections should be no different for consumers in Minnesota or Iowa than they are in California or Florida. Equally true, consumers deserve consistent safeguards across the online world, whether engaging with Facebook, Google, AT&T or Comcast." The paper, written by USTelecom CEO Jonathan Spalter, also discusses how the Constitution gives the federal government control over interstate commerce. What seems confusing is Spalter's use of the phrase "open internet" to discuss a policy where carriers can charge different rates for different content that streams over their networks. The author writes, "If we truly believe—as I do—that all Americans deserve an open internet, then we should fight together at the federal level for permanent, evenhanded protections that apply across the entire internet." But since repealing net neutrality could actually close off access to certain areas of the internet to those who can't pay for it, Spalter is actually in favor of a closed internet open only to those who can afford it. And so are Verizon and AT&T, apparently. Should some states actually implement laws that put net neutrality in place, you can expect USTelecom and its members to take them to court.